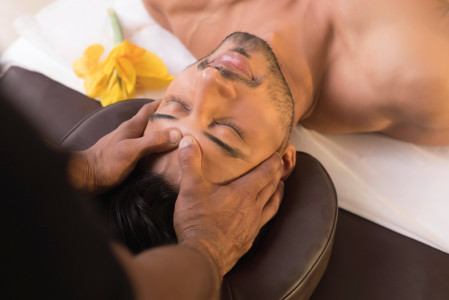 Rejuvenate yourself with body massage by senior male therapists at the comfort of your home. We offer services like swedish massage, foot reflexology, deep tissue massage for women by 4.5 rated male spa therapists with 5 years + experience near you in Hyderabad. We provide trained & experienced male therapists who are hygiene friendly. They will recreate spa experience at home and it includes massage bed,oils, etc. To de-stress yourself book full body massage at home now at UrbanClap! Excellent massage by Zon. Will recommend him to my friends. Very professional and did a very good job. Very nice experience. Wonderful service. When i booked the slot, i Was hestitant on how the service will be but im totally satisfied and would prefer this option going forward. As usual, awesome job by Goverdhen. The best person with professionalism n perfection at his service. Thank you Urabn clap for your service. So, my husband was very relaxed after his massage. Healing hands for sure! He was really good in his work. Totally satisfied ☺️. Exceptionally well done! Made me feel really good post the session. Thank you! Firstly thank you UrbanClap for the service provided. Great ambience created. Secondly thank you Shaik for providing great stretches and massage. On time and excellent professional service. Very professional and sincere guy. It was very good experience, since it was my first massage! Hannan was very courteous and professional. I would definitely recommend him. This particular service is only for men. We have a spa at home service on the UrbanClap app and the website for women who are interested in getting massage at home. Yes. Massage for men is a massage you can get at home or at a location that you are comfortable with. If you are looking at a therapy to relieve stress we recommend the full body massage (deep tissue). You can either opt for 60 minutes or for 90 minutes. As regularly as you want it. A massage always helps you to relax and everytime you feel the need, you can go for it. We do recommend you to get a massage done at least once in a month. The therapists who will be delivering the service to you will be men. We only have women therapist for women. A warm bath after an oil massage increases the blood flow and helps the massage to be more effective. We suggest you take a bath. TV is an unnecessary distraction while you are getting a massage. We suggest you keep the TV off during your massage therapy so that you can enjoy the massage and reap the benefits. You can but we would suggest you do not. A cell phone is also a distraction which will not help the therapist do the job right. When the therapist gives you a massage, they also create the right ambiance that will help you enjoy the massage. A quiet room with no distraction will help a great deal. The professionals on UrbanClap are verified and have gone through quality checks. They also come with credible experience and great references. Reading their testimonials on their detailed profile will help you decide the perfect therapist. The minimum booking amount to avail the massage at home service is Rs.499. As of now, massage for men is not a part of the UC wellness subscription. Only salon at home and spa at home service is a part of the UC wellness subscription. You do not have to worry about what to wear before a massage service. Our therapist will give you the appropriate clothes to wear during a massage session. A massage for men session would need enough space to place a massage table and for the therapist to move around easily. Yes you can. You can book the service for your husband.